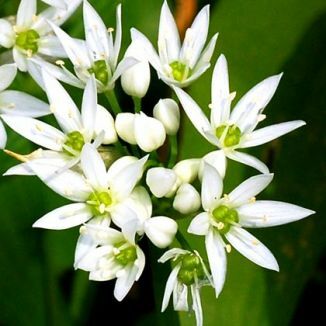 Ramsons is not easily confused with other wild plants on this web site. 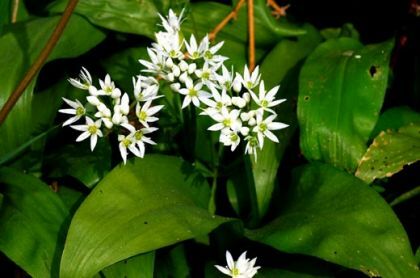 Also known commonly as Wild Garlic, this widespread plant carpets damp woodland in April and May with a display of spherical clusters of white, star--shaped flowers and broad, long, Lily-of-the-valley shaped pointed leaves. The individual flowers (15-20mm) are star-like and in umbels of 8-12 and the slender stem usually has only two basal leaves. Once this perennial is picked or bruised it gives off a very strong smell of garlic. This is a native plant and belongs to the family Liliaceae. I first identified Ramsons in Killiney, Co Dublin in 1979 and photographed it near Wellingtonbridge, Co Wexford in 2006. From the National Folklore Collection, University College Dublin. *NFC 107:341 from Co Wexford and **NFC S 36:246 from Co Laois. Ramsons is also known in other countries as 'Bear's Garlic' as the brown bear was said to like eating the bulbs. The leaves are fit for human consumption but be sure that there is no mistake in the identification as other similar leaves, such as Lily-of-the-Valley or Wild Arum (Lords and Ladies) are quite poisonous. If you're in doubt, just smell the leaves when squeezed and if you're squeezing Ramsons, the smell of garlic will convince you that you've made the correct identification.